I’m getting into the healthy food bowl craze after all! I love this amazing bowl of incredible flavors to create a sweet and spicy hoisin sauce, fresh steamed broccoli, tofu and noodles. Homemade hoisin sauce is so much better when you make it yourself. It’s free of preservatives and all the junk that’s in the bottled version. Double the recipe and keep the remaining sauce in your fridge, It will keep for a month or more! Combine the chopped vegetables in a medium sized bowl and toss with one tbsp of the oil. 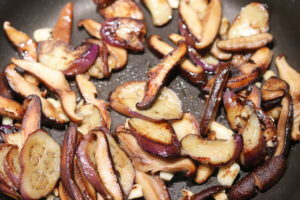 If you have a good oil sprayer like @EVOSprayer, that would really help to lightly coat the eggplant and mushrooms. Heat a non-stick wok over medium heat. When hot, add the remaining oil and allow to heat up for another minute. Add the vegetables and allow to cook for 2 minutes before stirring. 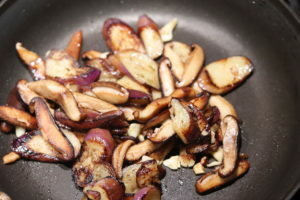 You should hear a good sizzle on the mushrooms. If your pan is a little dry, add a bit more oil, but be careful not to over grease. When the vegetables soften and have browned around the edges (another 5-8 minutes), remove from pan and set in a large bowl. Toss the hot vegetables with 2 tbsp of the hoisin sauce. Cost the vegetables well. 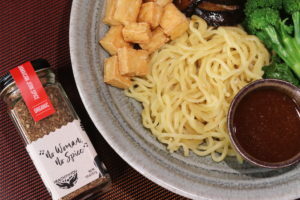 In a serving bowl, place the ramen first, then add the tofu, broccoli and the eggplant and mushroom mixture and fill the bowl. Sprinkle with the peanuts, scallions, and cilantro. Serve with a side of the hoisin sauce for dipping.